Every issue, we invite one member of the college community to share their delight in an object found on campus. 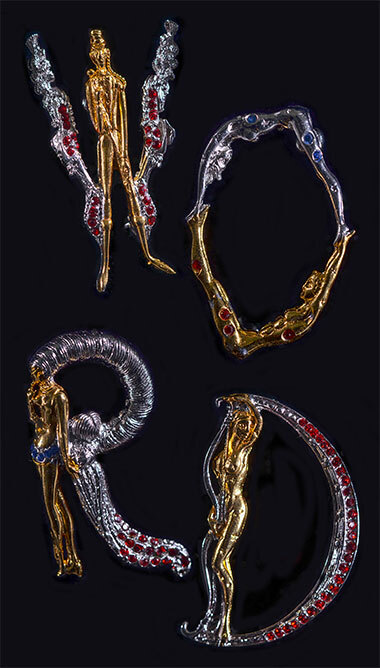 Here, Kristin Vogel (Library) speaks to an alphabet set of Erté brooches from the art deco period. For her, the set serves as a connection between the library and art. What’s a library made up of? It’s made up of ideas – and many of our ideas are communicated with words, which are comprised of letters. So the idea of an alphabet as a piece of art in the library, in my office, seemed both tongue-in-cheek and literal, as well as kind of fun. I love art. I love art in libraries. I love the idea of having art in my office that is from the college collection, so I can help show what the college has. This collection of pins is intriguingly beautiful. It’s something you need to be able to look at from close-to. You need to be able to get to it to see it, so I had to think carefully where it should be hung in relation to the furnishings of the room. It does read very dramatically from a distance. But you really need to be able to take a close look. Art deco is such an interesting style. I find it very compelling. You have to sort of embrace, in my opinion, the geometry of it and the ornamentation, the decoration, and the opulence, the luxuriousness of it. Even within their frame, these brooches look very tactile. One of the things I really like about them is that there’s texture evident in every single one of them. You can imagine the feel of the precious metal and of the jewels that were put in there. I do find them very whimsical, even a little humorous. Different letters appeal to me for different reasons – the “O” that’s just a little bit funny-shaped. I like the fact, too, that a number of the letters are formed by people facing each other, or interacting. Over the years, a lot of brooches have come my way through hand-me-downs and gifts from the estates of my grandmothers. As a form of jewelry they really resonate with me. So all in all there probably isn’t a better piece in the collection for me to be able to connect with on these multiple levels. 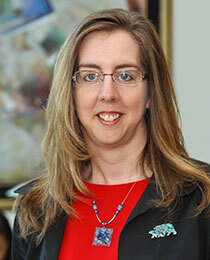 Kristin Vogel enjoys facilitating the work of the Mulva’s team of librarians and staff to ensure that the library exceeds expectations. As well, she has had the privilege of networking with librarians around the globe, including traveling on a Fulbright grant to Bahrain to work with the National Library and the University of Bahrain. She has also worked with academic librarians in Ghana and most recently in Uganda.